Pumpkins are an ideal fall decoration – no matter, faux they are or not, you may put them on your mantel, in a bowl to put on your table or somewhere else. The supplies are baker’s twine – in the color of your choice, paper mache pumpkins, small pumpkins and Mod Podge. 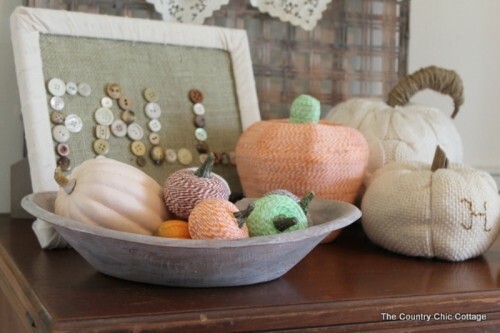 Coat a small area of a pumpkin in Mod Podge and begin to wrap in twine. Be sure to put your twine tight as you wrap so you don’t get any gaps. The end of the twine can be tucked under the stem on this end. Start with a small mini pumpkin and some Mod Podge. Wrap the small ones until you get the hang of it. Now you can make a large pumpkin. Let them dry and use as you like in your fall décor.